Jeffrey Franklin Kent (born March 7, 1968) was an American baseball player. He played second base. 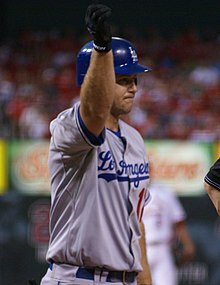 He played for six different teams, including the New York Mets, San Francisco Giants, and Los Angeles Dodgers. He was a five-time All-Star, and the 2000 National League MVP. In his career, he batted .290, with 2,461 hits, 377 home runs and 1,518 RBIs. He has more home runs than any other second baseman. He also drove in 90 or more batters in nine straight seasons. Kent was from Bellflower, California and went to high school in Huntington Beach. This page was last changed on 17 April 2019, at 11:53.